Britons are paying about $1.10 each to support Queen Elizabeth II and the royal family, Buckingham Palace said Thursday in an annual summary of its expenses. The palace, which has been under political pressure to control costs in recent years, said the senior royals' expenses totaled $66 million in the fiscal year that ended March 31, up 1.7 percent from the previous year. It noted that if inflation was taken into consideration, expenses decreased by 1 percent. "For the last couple of years we have indicated that the annual cost per person in the country in funding the head of state was equivalent to the cost of a loaf of bread," said Alan Reid, keeper of the privy purse. "With the passage of time, the loaf of bread has become stale and this year's expenditure per person, per annum, amounts to 61 pence ($1.10), or less than two pints of milk," Reid said. The biggest expenses were for property maintenance, utilities and telephone and other communications. The $66 million included money for activities of the queen and her husband, Prince Philip, upkeep on royal palaces housing many family members, and travel costs for royals on official duties. Among the newest expenses this year is the cost of drafting of tighter confidentiality agreements to keep chatty palace employees from divulging juicy details about the royal family. Princess Diana's one-time aide Paul Burrell published a memoir full of details about the breakdown of her marriage to Prince Charles. Accounts of public financing of the royals are published annually, but this year they are being released in a single report for the first time. In return for the public funding of the royal family, the government gets revenue from lands owned by the Crown. That amounted to $310 million in 2002-03, Buckingham Palace said. Royal travel cost $8.5 million and wine and other drinks cost $10,800, down from $46,600 in 2002, the report said, possibly because the Foreign Office or other branches of government now pick up the liquor tab for occasions like state visits. Among the other itemized costs were $4.1 million for renovations at Clarence House, the one-time home of the late Queen Mother Elizabeth, now occupied by Prince Charles, and a new staff area at Buckingham Palace, built for $1.2 million. The palace also said it plans to spend $11.2 million on information technology in the royal households in the next five years. 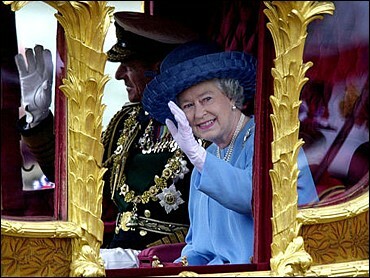 A number of state visits by and to the queen contributed to the increase in expenses, the palace said. Elizabeth traveled to Nigeria for a Commonwealth summit and hosted President Bush and Russian President Vladimir Putin on formal visits to Britain.